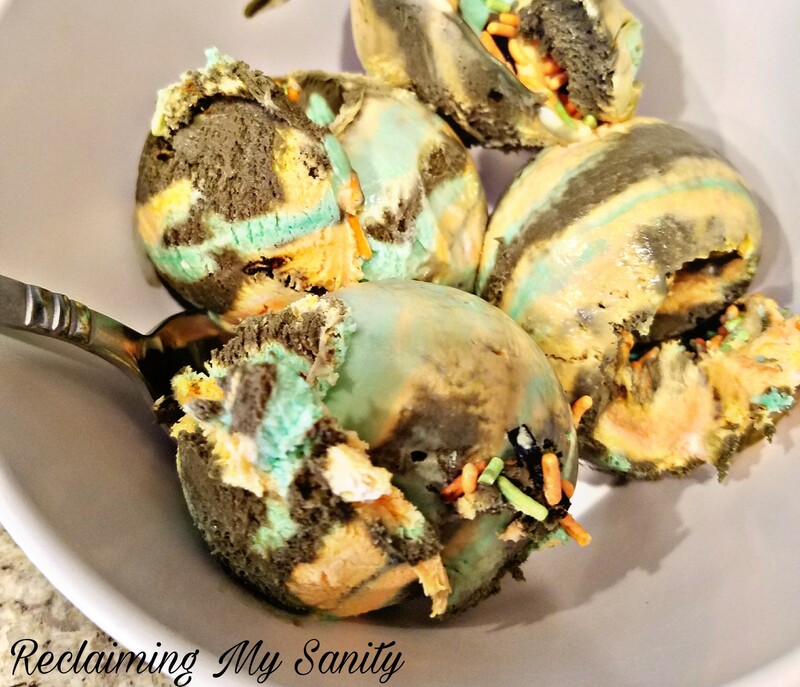 Awhile back Pickle and I tried making some homemade ice cream recipes. We tried this birthday cake one and this cookie monster ice cream. I personally like the cookie monster one the best out of the two. The other day Pickle brought up making ice cream again. 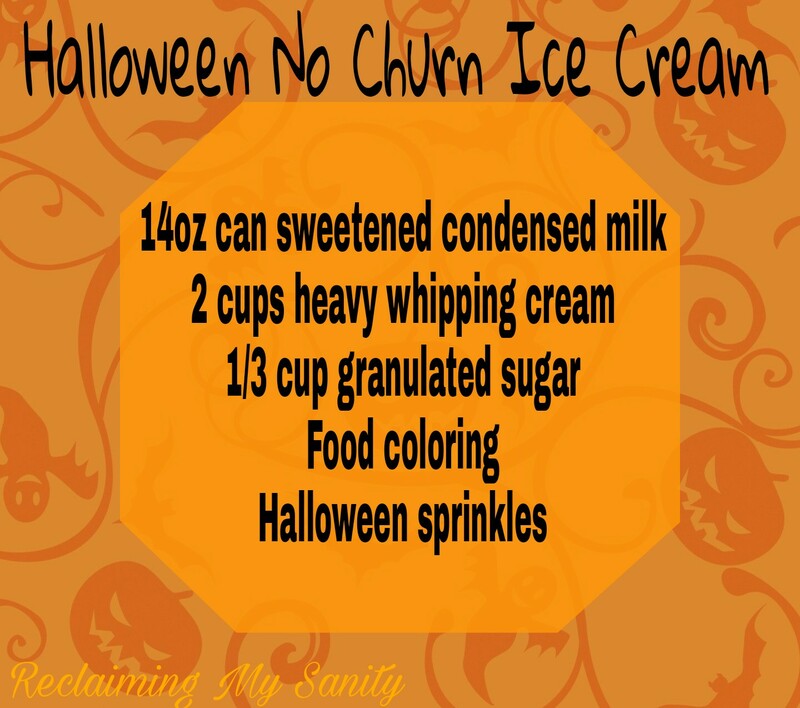 I still had 1 can of sweetened condensed milk left from the last time and I thought, maybe I could make a Halloween themed ice cream. I took a look at the birthday cake recipe so I knew what amount of ingredients to use. I knew I wanted Halloween colors, but I knew I only had red, yellow, and green to work with. So I figured, green, orange, and black(ish) would be fitting. 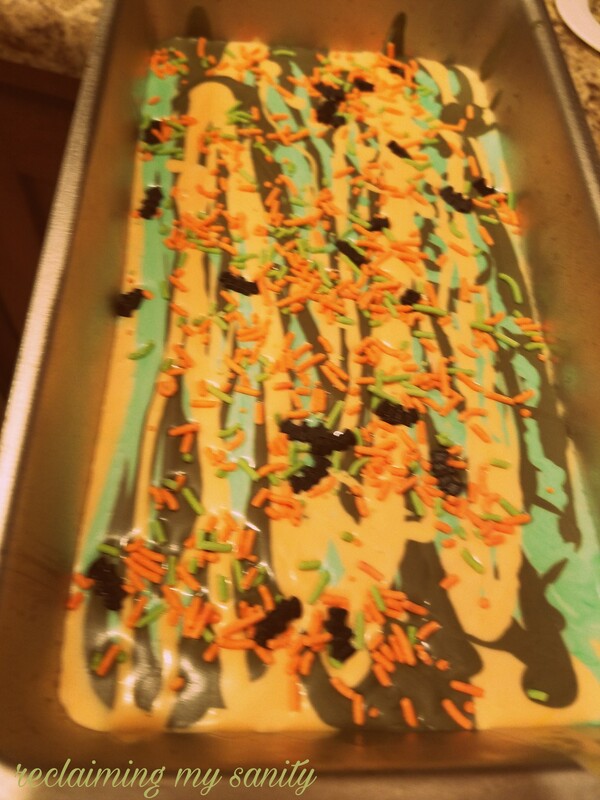 I also had some Halloween sprinkles left from a previous baking extravaganza. 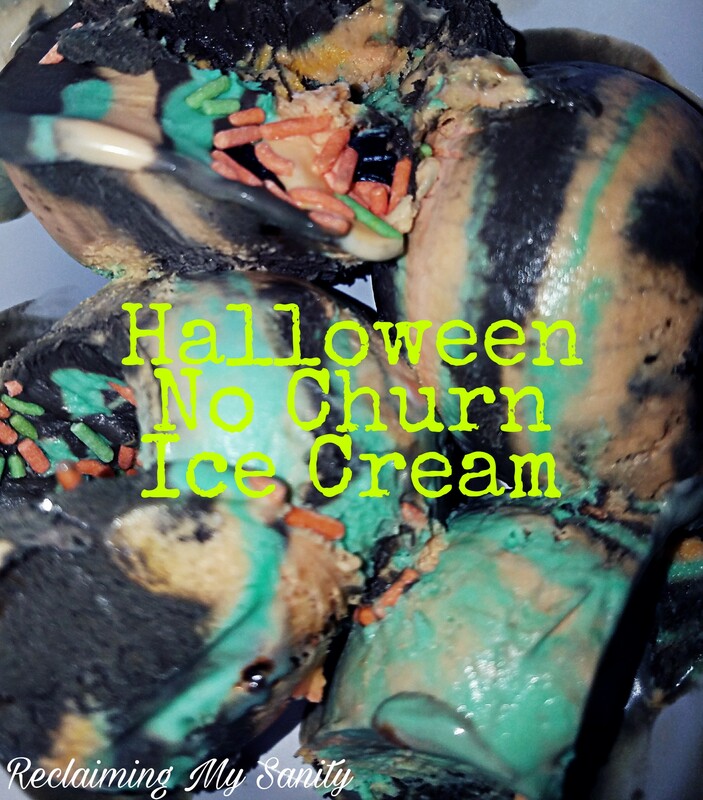 The whole process of making the ice cream took around 30-40 minutes and then freeze overnight. 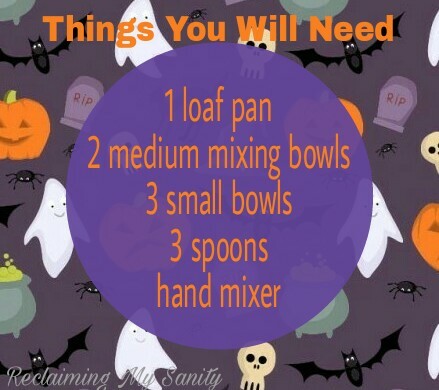 I started by putting my loaf pan and mixing bowl in the freezer to get cold. I do this because the cold seems to help the whipping cream to not take as long as it would without the chill. Whipping the heavy whipping cream works best in a cold metal bowl, but I only have plastic mixing bowls. They work, it just takes a bit longer. 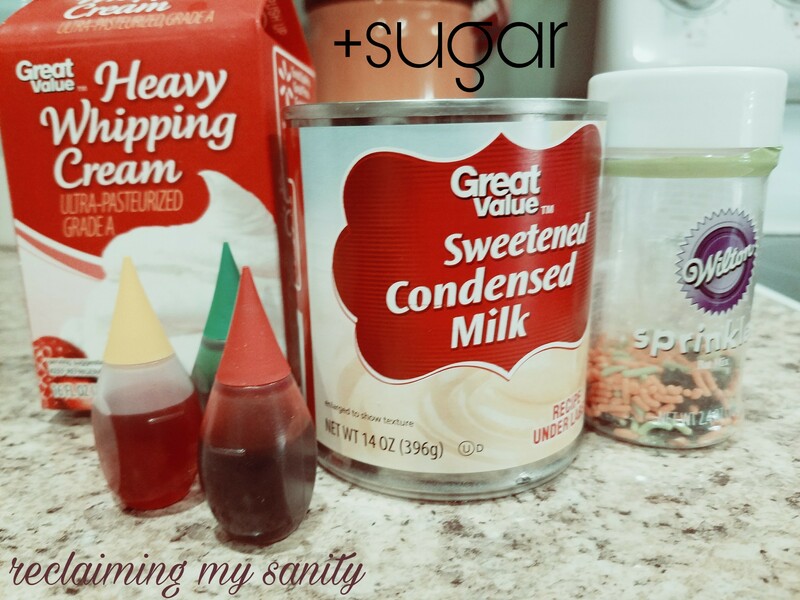 This recipe is on the sweeter side. Here is what it looked like before freezing. Put the food coloring into the small bowls (One green) (yellow +red=orange) (yellow+red+green=grayish color) I used separate spoons to stir each bowl so they didn’t mix. Mix until desired colors. Has society always been bad?